Here is the new Wolves home shirt manufactured by BURRDA. 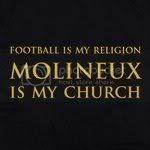 Available to pre-order from http://www.wolves.co.uk. Picture Courtesy of Wolverhampton Wanderers.